Germany’s Energiewende is the world’s most ambitious project to get an industrialized economy on a path towards a sustainable energy system. EDF’s Peter Sopher sums up the goals and lessons for the United States. As the academic breeding ground of Einstein, Freud, and many other internationally-known scholars, it should come as no surprise that Germany is at the forefront of modernizing an industry as complex as energy. Over the last two decades, Germany has been revamping its electricity sector with the ambitious goal of powering its economy almost entirely on renewable energy by 2050. And on May 11th, the country broke a new record by acquiring nearly 75 percent of its total energy demand from renewable sources (mostly wind and solar). Even the European Union’s recent announcement that it will begin divesting in renewable energy by 2017 hasn’t shaken Germany’s ambition to forge ahead in its quest to phase out fossil fuels. At the moment, Energiewende is the closest thing the world has to a renewables-integration pilot on a national scale. If successful, this blueprint will expedite the broad scale integration of technologies that will be necessary to wean the world off fossil fuels and combat climate change. Responsibility to future generations to choose an alternative form of energy supply wherever it’s technologically and economically feasible. Lead international climate protection activity by example. Make the country less dependent on energy imports. At present, Germany imports 97 percent of its oil, 90 percent of its natural gas, and two-thirds of its hard coal. Tap the budding clean energy industry’s economic potential regarding both jobs and GDP. Enable greater public participation in the energy sector via demand-side production, local cooperatives, etc. 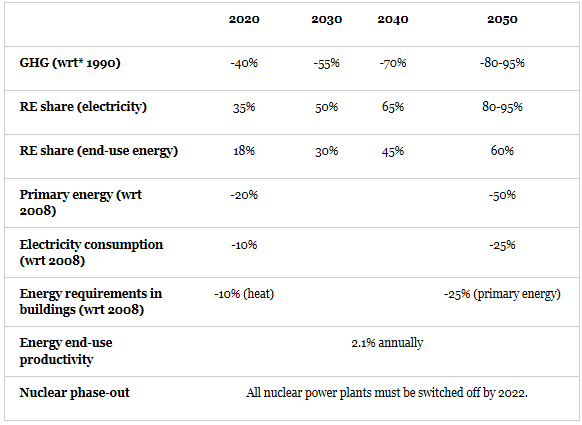 Table 1, below, highlights Germany’s climate and energy goals, including reductions in greenhouse gas (GHG) emissions, a significant ramp-up of renewable energy (RE) sources, both in the total use of electricity and the country’s overall consumption of energy (including oil, gas, nuclear, etc. and referred to as ‘end-use energy’ in the table), plus notable reductions in primary energy use, electricity consumption, and the country’s buildings’ use of energy. According to a 2013 report from Poyry, these targets are not legally binding (i.e. national targets of this level of ambition are not part of any legislative document). But they are politically binding, for they appear in a range of official documents. This shows the level of ambition possible without introducing formal legislation. The law catalyzing Germany’s renewable energy increases is the “Renewable Energy Law” (EEG), the first iteration of which was passed in 2000. Energiewende was later conceived in September 2010 when the Federal Government adopted the Energy Concept, which was revised in 2011 after the Fukushima meltdown inspired the German government to cut nuclear power from its envisioned electricity mix. A little over a decade after the EEG and just a few years after Energiewende’s birth, the German energy landscape has been completely transformed. According to the Hertie School Experts on the German Federal Elections (2013), renewables’ share in Germany’s electricity generation has increased from three percent in 1990 to twelve percent in 2005 to more than 22 percent in 2013. In the first quarter of 2014, renewable energy resources met 27 percent of the country’s electricity demand, double the approximately thirteen percent of U.S. electricity supply powered by renewables as of November 2013. One procedural insight Energiewende has underscored is that an energy transition to renewables entails both accumulating megawatt hours and optimizing this capacity. In Germany, renewables have become a central pillar of the electricity market. So now, the aim has expanded to optimizing the renewable energy mix through infrastructural and other investments geared towards making supply more responsive to demand. The past two years have seen multiple measures – such as the April 2014 bill that aims to “control renewables growth [while] enhancing market integration” – that water down incentives for Energiewende for various reasons, foremost of which is cost containment. While far more renewable energy capacity is needed, enough has been amassed such that massive strides towards Energiewende’s goals can materialize in the form of optimization improvements, even if capacity additions are reduced. EDF is at the forefront of leading a U.S. energy transition. The German example reveals that, while aligning politics, policies, and governance structure for such a transition is a heavy lift requiring robust agenda-setting efforts, implementation occurs quickly and with overwhelming economic benefits once these pieces are in place. Though U.S. and German social, political, and economic contexts differ – and policy solutions that were successful in Germany might not suit the U.S. – there are many important lessons the U.S. can learn from Germany’s experience with Energiewende. Catching up to a frontier is easier than forging one. Cell phones are prominent in many African villages that never had landlines. And followers can learn from leaders’ inefficiencies. In the energy transition context, the U.S. has the benefit of learning from Germany’s experience. Once the right policies and incentives are in place, the energy transition in the U.S. should occur even faster than it has in Germany. This post by Peter Sopher, Energy Policy Analyst at Environmental Defense Fund, was first published on EDF’s Energy Exchange blog and is reposted with permission. Previous PostFeed-in tariffs – a policy for the future? Next PostWill the real renewables surcharge stand up?